This photo is of a group of young ladies called The Maids’ Brigade. Of course all over the country there were groups of Boys’ Brigades, but this local group were unique. Theirs was the only brigade of its kind in the UK. The Maids’ Brigade were affiliated to the Reform Church in Lewes Road. What a dreadful name to call them! How lovely to see this photo, I was in the Maids Brigade from the age of 5 to 9 (when I moved to Hove) then again from age 12 to 14 years. I remember Mrs Gee, sitting on the right of the Vicar, and I think that is Miss Patching sitting next to her. This photo was taken after my time as the Vicar is a stranger to me. I also was in the Junior Dramatics of the church and had lots of fun taking part in the Pantomimes. It was through this site that I made contact with Sandra again, thank you for the memories. 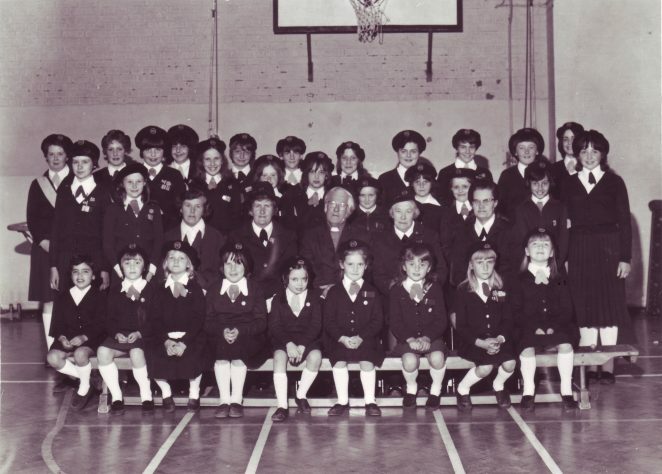 It looks like my late next-door-neighbour, Edna Fowler in there, who was apparently a Captain at the time it converted to a Girls Brigade company in 1985. I am typing out a eulogy for her funeral next week, and was intrigued to hear about this unusual group, so thought I’d do a quick search on the internet. If anyone who knew her would like me to pass on condolences to her husband, please let me know. Thank you so much for this picture. I was in the Maids’ Brigade from the age of 5 and am in this picture – back row third from the left with a rather mad perm!! Others in this picture are Alexandra Sargeant, Elizabeth Sayers, Ann Hussey, Karen Budgen and Wendy Budgen. I am sure Janet Budgen must be there somewhere and their mum who was an officer. Edna Fowler is indeed in there too with Mrs Gee, our Captain for many years. Also Hilary – can’t remember her surname! I was also in the Youth drama club with Dot Voller as our leader! Wonderful memories – thank you so much. Hi Kerry, I vaguely recall your name.. I too was in Dot’s youth drama group 74 – early 76 ish. I was also in the 13th BB so recognise the Sayers and Hussey names as well. When did you join Dot’s group? I can remember being down the hall for ‘rehearsals’ but cannot recall what we were rehearsing for or whether we did ever actually put a performance on! Kerry; I’ve been trying to place you and I had a flash of memory (while I was shaving as it happens, but don’t ask me why then!) – I suspect the name Godfrey may mean something to you? Yes indeed ! Godfrey was my maiden name. My brother was in the13th BB for a while – David. We put many productions on at Youth Drama but I can only remember Alladin and Little Women! I am so sorry I can’t remember you! I must have been in Dot’s group when you were – did you have a nick name? Were you/ are you a chef?! We were indeed contemporaries although, sadly, I don’t remember too much about you and only very remotely David. I remember Alex vaguely as well. I was (am!) Geoff Robbins and I left in 1976 to join the RAF and had very little to do with Lewes Rd after that although Mum remained committed to the Guild and Playgroup until she became too ill. As a result of leaving for the RAF I lost touch with most of my friends in Brighton (church and school) and have only recently started to look for people again. I wouldn’t be too sad about not remembering me. I was in touch with Alex for a while but have not been for at least 10 years or so now. She married Graham Askew who was at the 13th BB but they sadly divorced in the end. I am in touch with Ann Hussey and the Sayers very, very occasionally. I assume you are using Friends Reunited for your school friends. If you look me up on there, I can update you and let you know my contacts by e mail. I remember Graham’s name as well. I exchanged a few e-mails with Adrian Ball the other week, I promised to ring him but haven’t got round to it yet – I really must. I haven’t got as far as Friends Reunted yet, I’m working long hours and juggling various other self imposed tasks as well. Thanks to you, Geoff, you mentioned a name I’ve been searching in my memory without success. Adrian Ball was also part of the Gilbert and Sullivan Operettas at this very hall as I have mentioned top of this page. I have recently been writing a piece to go with some photos of the operettas that will all appear soon on My B&H. Thank you for that timely nudge. I have left you a message on Friends reunited when you get round to it. Enjoy your catching up and don’t work too hard. Sandra/Kerry, thanks to you both. Sandra; the only other name I can recall connected with Operatic Society (and which links in with something else above) was Ron(?) Fowler who, IIRC, was Edna’s husband and whom I recall starring as The Mikado in around ’74/’75. Edna also sang in the church choir. So glad you all enjoyed the photo and brought back memories for you. I forgot to mention when I sent the photo, that my daughter, Jayne Atkins is in the second row down, third from left. Her friend was Sally Arthur and you must have known Ann Hussey, whose dad was a BB officer. Yes, I was in Dot’s drama group at Lewes Road and my nickname is Bim and I am a chef. And hello to Kerry and all my old friends. Hi Bim, I recall your name although I must confess I can’t put a face to it- old age I guess. Hi Bim, I have only just read this. Hello to you. I remember you very well. The two of us and Anthony Fogden were an awesome trio. I hope the years have been kind to you. I have been looking for information on the Maids Brigade off and on for a number of years. I even wrote to the church but unfortunately received no reply. My mother was in the Maids Brigade. I don’t know when as I don’t know when she joined, but she was born in 1916. I do know that she stopped going to the Lewes Road church when she was in her teens as her mother wouldn’t allow it as boys went there as well. My mother was Hilda Phillips, they lived in Whippingham Road. I don’t suppose there is anyone out there who knew her? Hi all. My name is Sally Feest my sister was Valerie Reeves. We lived in Shanklin Road and were in the Maid’s Brigade in the late Fifties to Sixties. My particular friends were Christine Sargeant, Susan Steadman, Frances King and Marie Elphick. Beulah Russell and Irene Hawketts were our neighbours and were also in the brigade. I remember the yearly displays and prize givings at Yorke Place Hall, London Road. As teenagers, after Church we would sometimes go for a coffee with some of the guys from the Boy’s Brigade to the Penny Farthing Coffee Bar in East Street. I remember Geoff Fitch, Alan Hollis, Nicholas Welfare, and Allan Fowler amongst others. Sometimes when the lads played football matches at Whitehawk we would go and support them. In the school holidays we would sometimes hang out together and often go bowling or swimming and other activities. My sister Valerie Reeves was in the Operatic Society and was in a lot of the shows and pantomimes. There are quite a few names and memories I remember. When Val used to go to camp and my Mum would take me down to see her when it was family visiting day and I couldn’t wait until I was old enough to go and what fun I had when I did go. Oh happy days. Hi Sally here. I have remembered another name from my group of friends,and that was Pamela George. Pam had a sister Mary and I believe another sibling whose name I don’t remember as they were more my sister’s age group although I do recall a lot of their names. You might also remember my sister – Sheila Robbins? My sister, Brenda, and I were in Maids Brigade in 1950s and Junior Drama. I was Buttons once in panto. I remember Beulah, Elaine Burlington, Mrs Gee & Valerie, Mary Triggs whose mother was very kind to me. Despite the dreadful motto which went something like ‘true womanhood a godly and clean life’ we were encouraged to be active, self-disciplined and community minded. I loved it all until my teens. Anyone out there remember us Harwoods? I was a member from 1955 to 1973 when I moved away from Brighton. My name then was Rosemary Styles. I remember you Rosemary, I hope you remember me too. I hope you and your family are all well?